Erin over at Elements of Style had a contest last week to win a copy of the Domino Book. 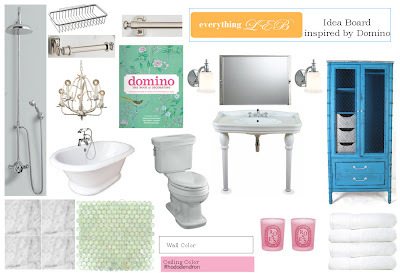 The challenge was to come up with a mood board inspired by one of the 4 images that she chose. Thanks Erin for posting mine as a runner up! I loved it! I really wanted to know where the blue cabinet and the chandelier were from! Love that punch of blue!! Where did you find the turquoise cabinet? Sacheverelle, it is from sultanchic.com- isnt it so pretty, I love it! What does the above comment mean? Is that some kind of spam?